A leading Utopia artist, Barbara Weirʼs mother was Minnie Pwerle and her father Jack Weir, the owner of a station adjoining that of Utopia. She had a unique relationship with Emily Kame Kngwarreye who was Weirʼs main carer as a child before she was taken away by Native Welfare Patrol at the age of 9. After years of living in various other families and schools all over Australia, not knowing the exact origin of her birthplace or home, she rediscovered it after some years of searching in the 1960s. Indonesia to work with traditional batik makers. She started painting around 1995 and has become a highly popular and successful artist, travelling often with her work to exhibitions internationally. She has exhibited jointly a number of times with Gloria Petyarre 1998–2006 and with her late mother Minnie Pwerle including in her first exhibition in Sydney (AMP Building) during the Sydney Olympics, 2000. All of Weirʼs paintings are abstracted representations of the once fertile lands of her motherʼs country at a time when plants, animals and water (which is considered sacred) were plentiful. Themes of her paintings include grass seed, bush berry, wild flowers and Awelye (womenʼs body design). A significant series is called My motherʼs country. These finely-wrought paintings depict waterholes, sacred sites, coolamons, digging sticks and many other images including the spirit figure/creation spirits overlaid with layers of fine dots. Amongst her most popular works are the gestural, expressionistic and often highly coloured grass-seed paintings which reflect both the movement of the grass as native animals move through it and the once-rare bush grass seeds which were ground for damper. In 2004 was chosen by the Australian Tourist Commission to appear in an advertisement titled ʻBarbara Weirʼs Australiaʼ. 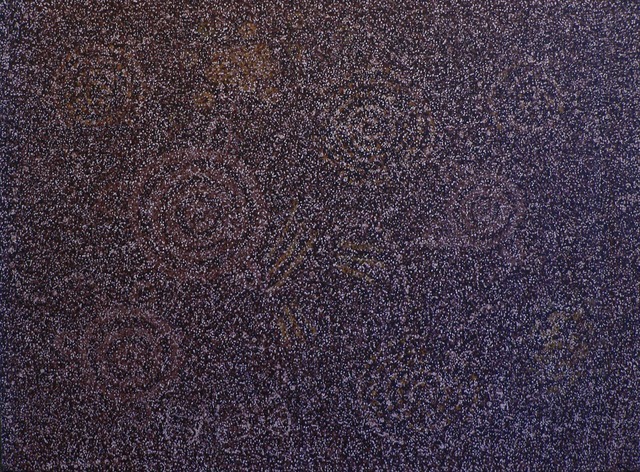 Vote for this artwork and share it with other Aboriginal art devotees!